Juwon received his BA in Comparative Studies, specializing in Comparative Ethnic and American Studies with minors in Asian American Studies and Russian. 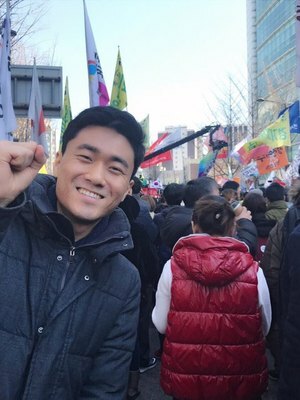 During his stay in South Korea after graduation, he was active in queer activism and refugee movement. He is currently interested in how South Korean queer activism navigates through hegemonic imperial powers and neoliberal global economy while envisioning radical queer politics. In particular, his research looks at how the Seoul Queer Culture Festival constructs and represents marginalized sexual "Others" by simultaneously participating in and contesting the global queer politics. Does the endorsement of the ambassadors from the Global North nations and multinational corporations, as well as the usage of the globalized term queer signify the festival organizers' co-optation of the hegemonic and neoliberal powers? Leading with this question, his research ultimately aims to challenge a monolithic narrative around global queerness and calls for a more complicated analysis of queer narratives in South Korea. Additionally, he is also interested in theorizing race relations in South Korea and East Asia as well as Posthumanism and Critical Animal Studies.